Last week, we saw the glorious new Optimus Prime toy that transforms into a Playstation 1 of all things. However, I failed to inform you, dear readers, that there was an accompanying Megatron that is just as awesome, if not even better. Behold, Genesis Megatron! 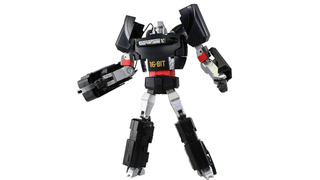 Like Takara Tomy's transforming Optimus, Megatron stands at around 19cm tall and set you back around 10,000 yen, or $90. But he's even better, because of his name and console of choice. Now see, this doesn't really play in the US, because you guys called it the Sega Genesis, unlike the rest of us - we christened Sega's third console the Mega Drive. So this is the Megatron Mega Drive. THE MEGATRONDRIVE. Perfection. Oh, I do hope that Sonic the Hedgehog cart can be spat out of Megatron's chest like it's a giant, aerodynamically challenged projectile. That would be amazing. Megatron will be arriving a little earlier than Optimus, due to release later this month - and just like him, if you're inclined to pre-order one you can do so at Hobbylink Japan and AmiAmi.